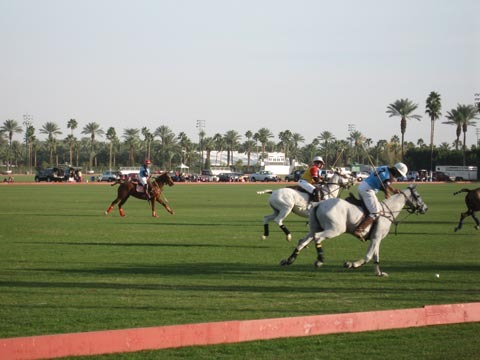 Opening day of both world class polo clubs in Indio, the Empire Polo Club and the Eldorado Polo Club, was this past Sunday, January 9. Since I am a social member of the Empire Polo Club, naturally that is where I spent the day watching the polo matches and socializing. They also had a contest for best hats, so I wore a big yellow number that I had bought at Marianne’s in downtown Palm Springs, where I also indulged in buying two more hats since it seemed like they were going to come in handy, and they sure did! 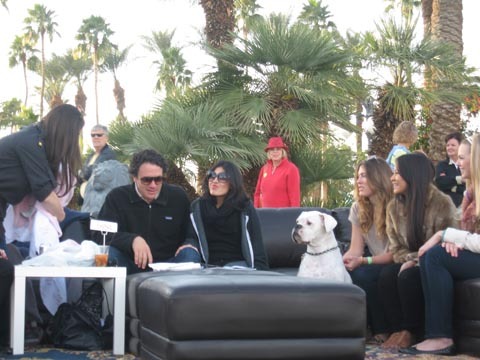 I did not win a prize that day, although many people told me I should have, however I did win a prize the night before at the Empire Polo Club’s Red Party in the tent next to Medhjool Lake on their beautiful grounds. 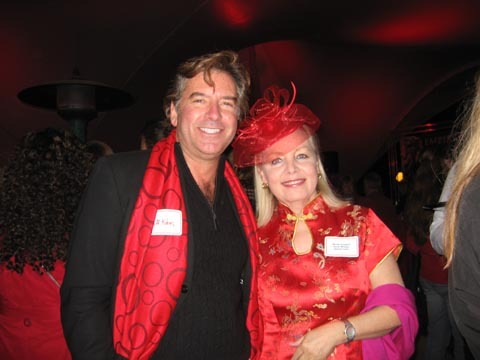 As you can see, the red hat came in quite handy as did the silk dress that I had custom-made for me when I was in China a few months ago during October, 2010. I was thrilled to win one of the prizes for Best Red Costume, which was a $50 gift certificate to use in the fun Tackroom Tavern, which is part of the Empire Polo Club, and open to the public. 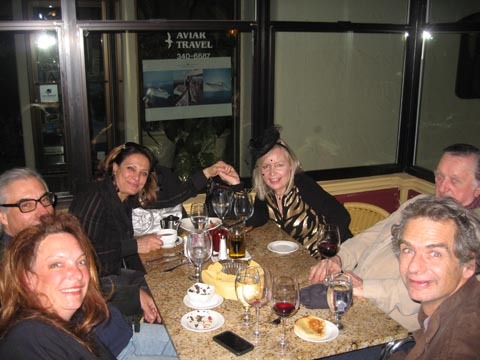 That is a great place to go after watching polo matches for some vittles and spirits, conversation and people-watching! It seems like someplace in Jackson Hole, Wyoming, although I have not been there yet! Polo game paraphernalia decorate the walls and some of the bar stools are made of saddles. As usual, watching the polo matches are very exciting and better still if you bring binoculars to see the action up close. Sometimes the action gets very close up if the ball comes your way! 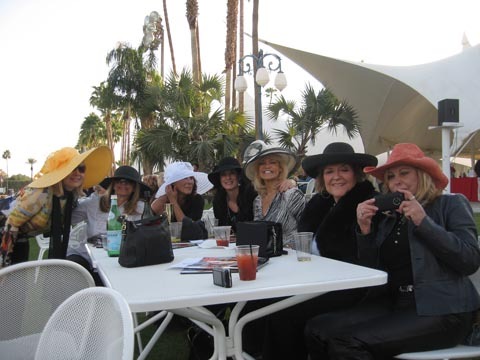 It is always fun to socialize with old friends and new at the polo matches, in such a beautiful environment with our perfect winter weather here in the desert. Many people bring picnic lunches, blankets and chairs and tailgate while watching the matches. 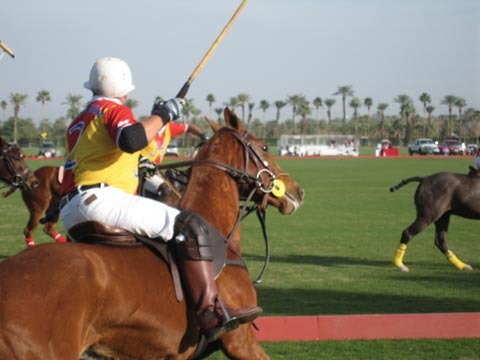 There are typically two polo games, one starting at noon and the other at two in the afternoon. 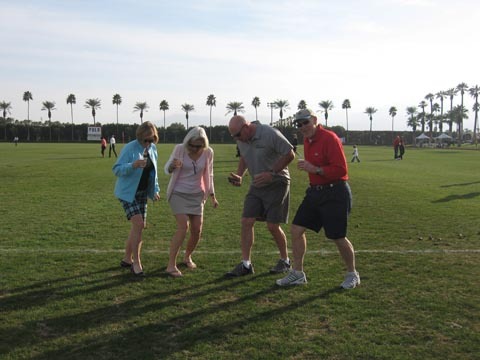 At half-time during the 2pm game, the tradition is to take a complimentary glass of champagne, Korbell, usually, and go into the field to stomp the divets and socialize with other spectators. Just make sure you stomp on the divets and not something else the polo ponies might have left behind! Dogs are very welcome and popular at the polo games so feel free to bring your favorite canine. On this day, I even saw a woman bring her gorgeous Bengal Cat on a leash to the polo game, but the cat did not seem very happy to be there! 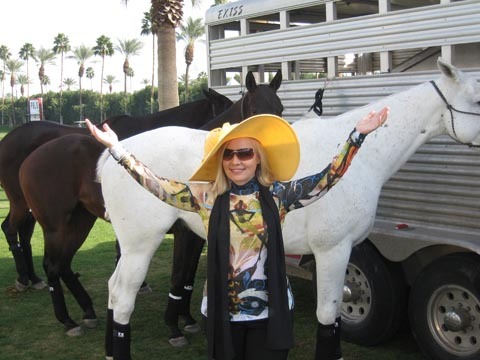 The Celebration of the Horse is also found at art galleries along El Paseo in Palm Desert, our “Rodeo Drive” of the desert, which features upscale boutiques, stores, restaurants, cafes and galleries. Last Thursday, January 6, the fabulous paintings of horses by Ashley Collins were featured at the Melissa Morgan Fine Art gallery, with the artist in attendance, so one could ask her questions about her paintings and congratulate her on her achievements. 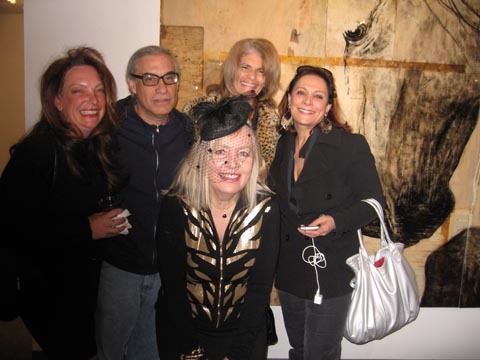 Many of my good friends showed up as well, as it was also Art Walk. Art Walk on El Paseo takes place on every first Thursday of each month during our season, from October to May. People stroll from one end of El Paseo to the other, or hop on the complimentary extended golf cart, to visit the various open galleries along the way. 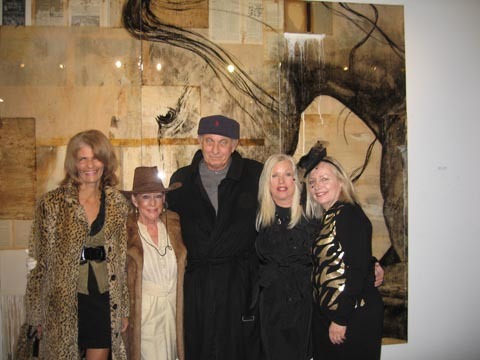 Above is a group photo standing in front of one of Ashley Collins’ dramatic painting of a horse. 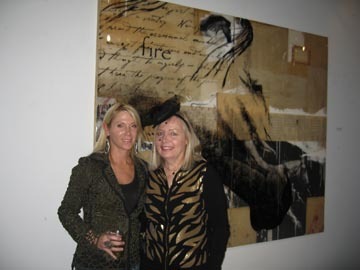 Her paintings are usually quite large, feature pages of newsprint or music as part of a collage along with painted horse imagery, topped off with a clear glossy coat, over shades of black, brown, golds, tans and white, all on a base of wood. After the galleries closed, which is always around 8:30 to 9pm, some of us headed to the popular Enoteca Bar at Mama Gina Ristorante where they have excellent food and wine at great prices! Price-wise, that is the best spot to go to. However, if you feel like splurging a bit, other places that I can also highly recommend are the Third Corner Bistro, Firecliff and Augusta. There are many others as well, and you will enjoy sampling them all eventually to find your personal favorites. This coming Friday, there is the “Horse Show” featuring the horse-centric art of many artists, including Ashley Collins, at the Melissa Morgan Fine Art gallery at the west end of El Paseo where it meets Hwy. 74. The reception begins at 5:30 and ends around 8:30 pm. It should be another interesting and fun-filled evening!